“A carbon tax, where the revenue raised is returned to U.S. citizens as a rebate, is the most effective and efficient way to reduce carbon emissions,” Flake tweeted Thursday, promoting a new push by carbon tax advocates. Flake introduced similar carbon tax legislation weeks before leaving office. Flake’s bill would have taxed emissions at $15 per ton that increased $10 per year until it hit $100 per ton. 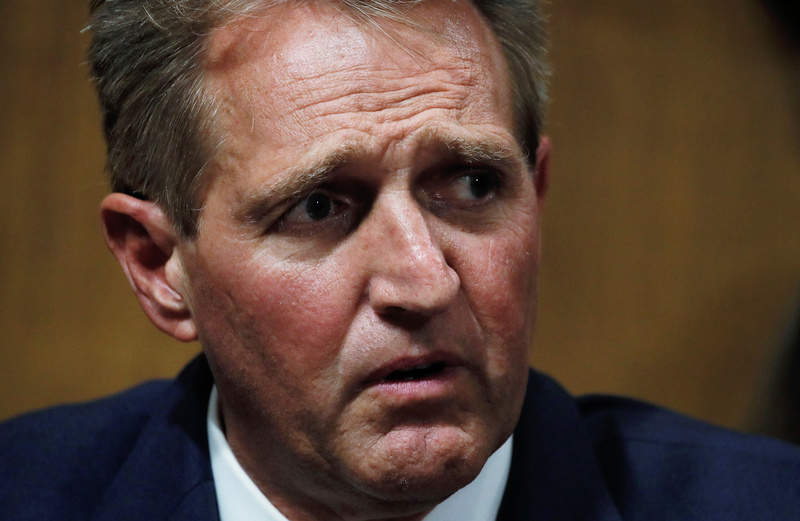 Flake also authored the 2017 book “Conscience of a Conservative,” which rejected the Republican Party’s embrace of President Donald Trump. Flake is responding to a letter that 45 economists, including Nobel Laureates, published in The Wall Street Journal Wednesday, calling for a carbon tax. Letter signatories include former Federal Reserve chairs Alan Greenspan, Ben Bernanke and Janet Yellen. The economists backed a carbon tax plan put forward by the Climate Leadership Council. CLC often sells its carbon tax plan as a “conservative” solution to global warming, though most conservative groups disagree. The idea is that Americans will have an incentive to cut their emissions to make money off the rebate. For example, a family that gets a $2,000 rebate could cut their energy bill to $1,800 to pocket $200 a year. “The majority of American families, including the most vulnerable, will benefit financially by receiving more in ‘carbon dividends’ than they pay in increased energy prices,” economists wrote in their letter. Senator Jeff Flake (R-AZ) explains the conditions attached to his “yes” vote to move the U.S. Supreme Court nomination of Judge Brett Kavanaugh forward. REUTERS/Jim Bourg. However, the vast majority of Republican lawmakers do not support a carbon tax. Most conservative groups oppose taxing CO2 emissions as a way to tackle global warming, arguing it hurts the people who can least afford it. Conservative critics say carbon taxes would raise the price of virtually every good, and creating a new program to dole out rebates would grow the government’s control over people’s lives. “[A] carbon tax would be detrimental to American families and businesses, and is not in the best interest of the United States,” 20 conservative groups wrote to Congress in April, including Americans for Tax Reform, Americans for Prosperity and the Competitive Enterprise Institute. Flake’s critics point out the former lawmaker only introduced a carbon tax bill because he was on his way out of office and didn’t have to face voters in another election. In the past, Republicans who spearheaded carbon tax efforts did not fair well at the ballot box. Flake is reportedly in talks with CBS News for a role at the network. Flake was spotted at the company’s headquarters in New York City in early January.